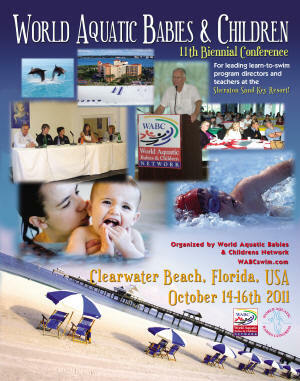 Who will represent YOUR country in Clearwater Beach for WABC 2011 ? Contact Jim Reiser swimprofessor@sc.rr.com for details and registration. Register below by September 1st and get your online test/certification endorsed by WABC at NO COST ($10 value). Parent & Me Training Course - A video based course for teaching infants and toddlers using a progressive, but child-centered approach. Swim 101 Training Course - A video based course for teaching beginners ages 3-5, using a progressive, child centered, and activity-oriented approach. It's just Goofy to come to Florida and not come to the World Famous Beaches! 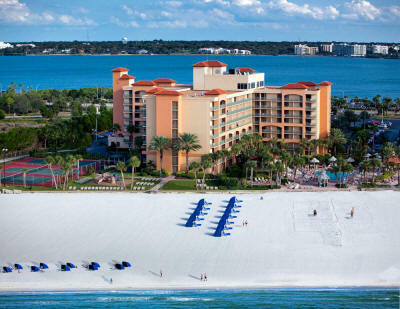 is the Sheraton Sand Key Resort on the white sugar sand beaches and warm Gulf waters of Clearwater Beach, Florida USA. It would be just goofy, to come to Florida and not visit this World Famous Beach! The WABC conference, the 11th since 1990, is focused on teaching methods, strategies, and sequences for babies, toddlers, and young children as well as administration and development of programs - which when grouped together touches on information related to 90% or more of your students. A WABC conference gives you the connections that bring an immediate return and keep on doing so year after year. Don't miss this opportunity! are a balance of 'fresh' and 'favorites'. Many new experts not seen/heard on the WABC stage before plus updates by favorite presenters from You'll get lots of NEW ideas! 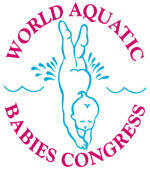 This educational event will be a gathering for learn-to-swim teachers and program directors from around the world. With a wide variety of philosophies, teaching sequences and methodologies represented and showcased. Come interact with others - learn and share. This will be the tenth biennial in a series begun in 1990 and traditionally features leading authorities worldwide on the learn-to-swim process for babies and young children. Participants will be able to choose from a variety of hotels, inns and bed & breakfast lodging ranging in price from economy to elite. A roommate pairing service will also be offered. WABC has kept the attending teacher's budget in mind both for fees of participation and lodging. The swim lesson program is often the 'cash cow' of the total aquatic program - bringing in the most revenue...so it is time for the program to 'pony-up' and send you for professional interaction and education. Insist on it! And the World is coming to your doorstep! Attendees can register for the entire conference or participate in just a day or two if that is the time they have available. Lodging can be shared if desired. Contact WABC to advise that you seek a roommate to split the cost of lodging. We will assist. Some participants maybe able to stay as few as two nights in the hotel if that is what you want to do. Florida and other eastern and central time zone attendees could arrive on Friday morning and depart on Sunday afternoon - since the conference schedule has been set to make that possible for you. Consider however participating in pre and post conference offerings. Or extend your stay, since the conference lodging room rate applies 3 days before and after our 14-16 October dates. 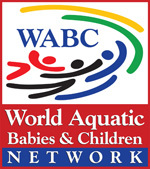 The WABC organization formed and series of conferences were initiated and inspired by Virginia Hunt Newman, internationally honored swim teacher and author of books on gentle child-centered teaching of babies and young children.